Nutshell: tired of the same-ol’, same-ol’ when it comes to spooky stories set in the deep woods? 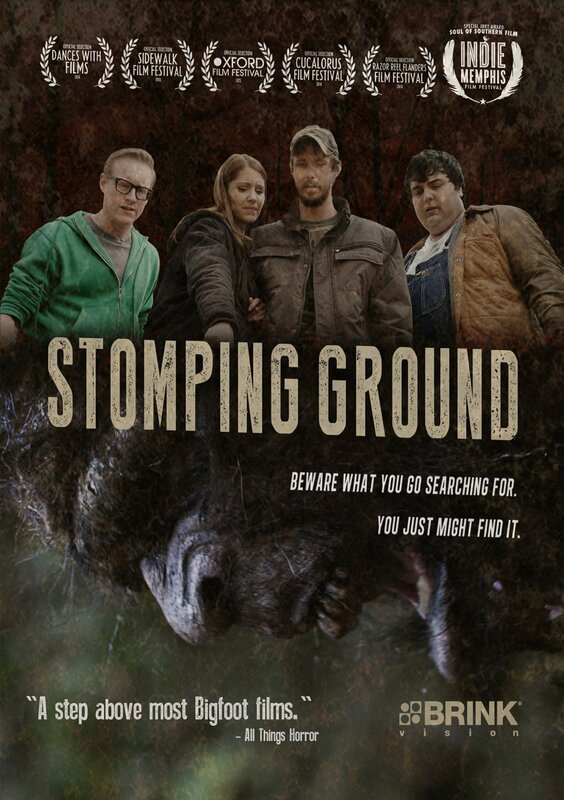 Stomping Ground is a film that digs into mythology and interpersonal dynamics to amp up the suspense, rather than the ol’ run-run-slash. Big bonus points for avoiding usual cliches and going with a straight-on spookfest. Atmospheric, ominous, and downright creepy. Bon appetit, monster fans. Chicago hipster Ben spends Thanksgiving in his girlfriend Annie’s small North Carolina town. One night out with Annie’s old friends, and “Big City” finds himself out for a camping trip…and finding Bigfoot is on the agenda. Is he being played, or are they really being stalked? While IMDb lists this as a horror/comedy, I wouldn’t slide it into that overused subgenre. It’s more a throwback to 80s horror, where characters laugh, joke, and bond with the audience before things get bloody. With all the wham-bam-slice-dice films coming out lately, it’s refreshing to understand these characters a bit before the screaming starts. The screenplay by Andrew Genser and Dan Riesser lets things unfold slowly, including the motivations of each character. Director Dan Riesser keeps things low-key, avoiding silly things like jump scares and the ever popular parade-of-previous-kills. These characters aren’t stupid cliches, which in and of itself makes me want to recommend this film. Our band of Bigfoot hunters don’t stick around when things go bad, they don’t run towards danger, and they’re smart enough to know when to stop trying to find friends that have “gone missing” once it’s obvious that Something Went Down. Jeramy Blackford gets a special mention, for his role as Annie’s high-school ex, Paul. It’s Blackford’s slow boil – along with the screenplay that allows equal parts monster and interpersonal horror – that gives this movie a duality that helps it rise above the usual “where’s the monster?” story. As for the rest? The special effects here are just as low-key as the pacing of the film, with bits and pieces (sometimes literal) serving to guide the characters and audience to the final conclusion. Maybe because it’s low-budget, maybe because the filmmakers decided to keep the focus on the characters…unsure, but it works. I’m also loving the bluegrass/folk/country music during the party scene towards the beginning of the film. That same awesome tuneage carries through the film, and while I was really digging the melodies, they never pulled me out of the action. I’m also loving the gorgeous shots of North Carolina’s Uwharrie National Forest, complete with lots of extreme close-up nature shots that are stunning without being pretentious. Now I want to check out Uwharrie National Forest…y’know, for science. The ending doesn’t tie everything up in a bow; there’s still plenty to wonder about. Not in an eventual sequel kinda way (another cliche dodged, thank goodness), but in the way a real-life story would go. And that’s all I’ll say about that. Verdict? Definitely worth checking out. This entry was posted in Movie Reviews and tagged Horror Movies, Indie Films. Bookmark the permalink. Thanks a ton for this amazing review! We love it when folks truly get our little film!